"I'm really thrilled to be involved in the Cycle of Songs project this year. It is an excellent opportunity to invite the people of Cambridge to sing, those who already sing in Choirs, but also to reach out to those who are not in a Choir and would like to join the Cycle of Songs Choir. I'll be leading this special choir during June, when we'll meet on three consecutive Wednesday nights, which will be free and open to all - children and families welcome too! Also, I'll be co-creating one of the new Cycle of Song pieces with my colleague, Kirsty Martin, to compose an anthemic piece for all the Choirs to learn for the app recording and to sing together at the June and July public events. Working with singers across Cambridge is going to be a busy but very rewarding project." Rowena Whitehead is a singer, songwriter and Natural Voice teacher with a background in teaching, training and community development .Over the past 20 years she has been sharing her passion for singing with people of all ages and abilities throughout the UK and beyond and she is well known for her engaging and relaxed approach in enabling people of all ages to connect with their voices and sing together. Rowena sees singing as a vital tool in community building and much of her work focuses on counteracting social isolation by enabling individuals and communities to come together to share their voices in creative processes . 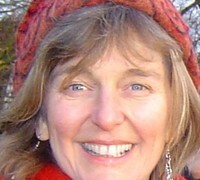 In 2004 she set up the charity Talking in Tune Community Music (www.talkingintune.co.uk), which promotes singing for social change by creating singing and music opportunities for all. She leads ReSound, an cappella choir in Cambridge, and runs Singing for Health courses and Singing for the Brain groups. Rowena is also visiting voice lecturer at Anglia Ruskin University and Westcott House, Cambridge University. She has trained Music Therapy students in therapeutic voice work, runs residential training course for voice teachers and is involved in voice projects evaluating the health benefits of singing.